My answer was a little different: Starbuck’s cafe mocha. There aren’t that many foods that I would want to eat every day. And I usually don’t feel that guilty about indulging in any one particular food. But I would love to be able to drink a cafe mocha guilt free. Ahhh… those 450 calories of sugar and caffeine flowing into my body is one of my favorite treats. In fact, if I had to choose between eating all of my daily calories and drinking them, I would probably choose to drink them. Drinking sugary drinks is definitely my downfall, and I’ve let it get way out of control the past few months. Whether it’s Starbucks, a Coke or sweet tea, I’ve pretty much become a hummingbird — drinking my weight daily in sugar. I had been thinking about making a change for a while. Threatening myself, I guess you could say. But on Monday, I got up and just did it. I didn’t scoop any sugar into my tea. I didn’t go through Starbucks. I didn’t drink a Coke. I didn’t completely give up sugar in every form, but I did avoid putting sugar in any food or eating any desserts. Day One went great. (Of COURSE, I created a 63 day chart to help me!) 🙂 Day Two I had an unbelievable headache, but I was much more prepared this time than last year when I gave up sugar. I had a fridge stocked with healthy food and I made sure I didn’t let myself get too hungry. That is always when I reach for a quick sugar fix. Today, I decided to add some fun drink options to my fridge to keep going in the right direction. 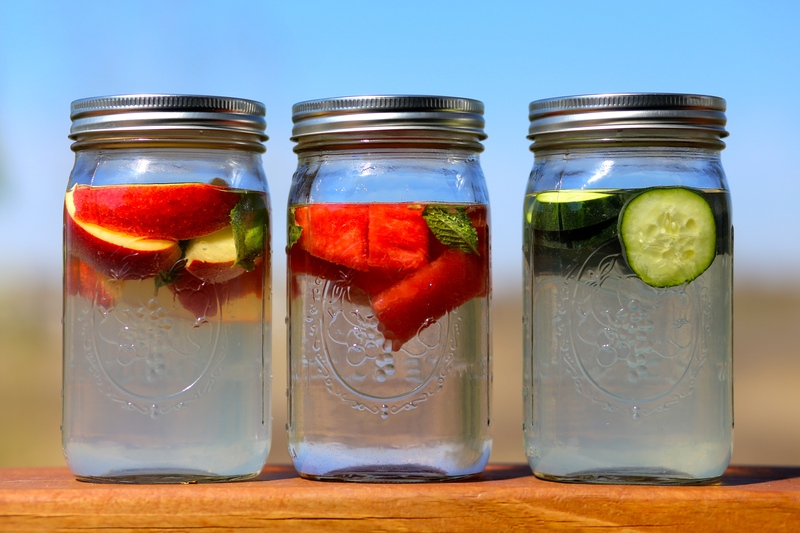 I made these jars of water, and they are SOOOOO delicious! I seriously can’t stop drinking! I made a few different flavors so I would have plenty to share with my daughters, who also love stuff like this. Previous Post Previous post: lunch! Sugary drinks are *MY* fave treat, too!!! At Sbux: 7-pump no-water chai tea latte, and at my bubble tea place: almond milk tea with ginger, tapioca, & agar jelly = MY MOST BELOVED CALORIE SOURCES!!! But I *do* love your infused waters! If I’m not drinking my beloveds, I’m drinking water. I gave up all soda, and I’m not a juice person.